Green BEAN Delivery connects Midwest food producers with Midwest communities through its year-round home delivery service. Our direct line to organic vegetable producers and local artisans guarantees our members the freshest organic produce and groceries on the market. They deliver fresh produce and other items to your door! This is the box they delivered in and it kept the produce inside nice and cool until we could put it away. This is a green smoothie that consisted of blackberries, carrots, strawberries and spinach. Yummy! I love sandwiches but I don't like all the calories that go along with bread. I have found another use for my kale growing in our garden. Kale wraps. This one is ham, cheese, hummus and kale. Yummy! I finished my first BFF sock. I am tickled pink how cute this sock is. Poo is getting older and sometimes he just doesn't get his body completely into the liter-box to do his business. 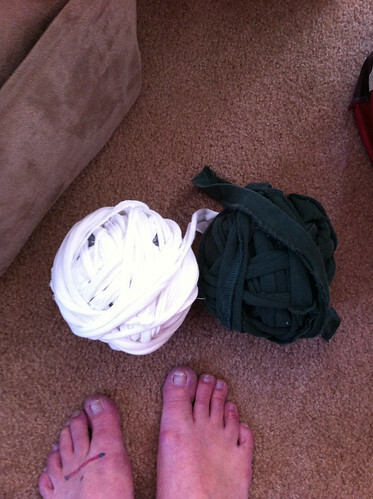 A neighbor gave me an idea to use washable rugs under the liter-box. I had recently found a way to use cut up old t-shirt to make knit rugs. I solicited my Facebook friends for stained up t-shirts they wanted to get rid off to make a few rugs. I picked up this monster, size 19 and 47", needle to knit it with. YOZA that is a big needle you have there. I started cutting up the t-shirts. Here are a couple of the "yarn" balls ready for knitting. I knew it was going to happen soon and I have been very excited about it. I was trying to figure out a way to have a contest for the 10,000 person but I couldn't figure out the logistics of proving they were the ONE! By now you are probably like UGH what is she babbling about now..... My blog has officially had over 10,000 hits. Thank you so much to everyone that has come to my little space and read/commented. I appreciate you all. I have a Poo update. This week his Pemphigus (read about it here in an earlier blog post) flared up so hubby took him to see his Vet. He is back on some medicine to see if we can knock it back into remission. We are going test his blood sugar daily to make sure he doesn't need an insulin dose change. He is still running around the house and he spent some time out on the patio this morning before it gets to hot. We are hoping he gets better quickly, as has been the case in the past. 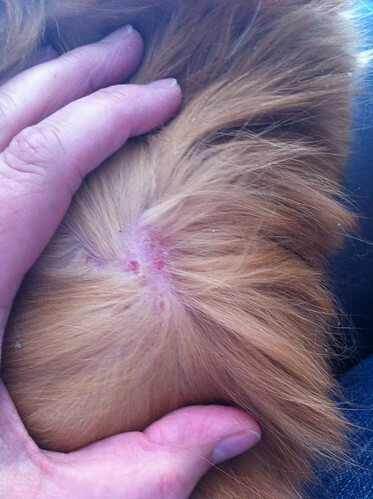 This is a photo of the affected skin. Attention Harry Potter fans you will love this. 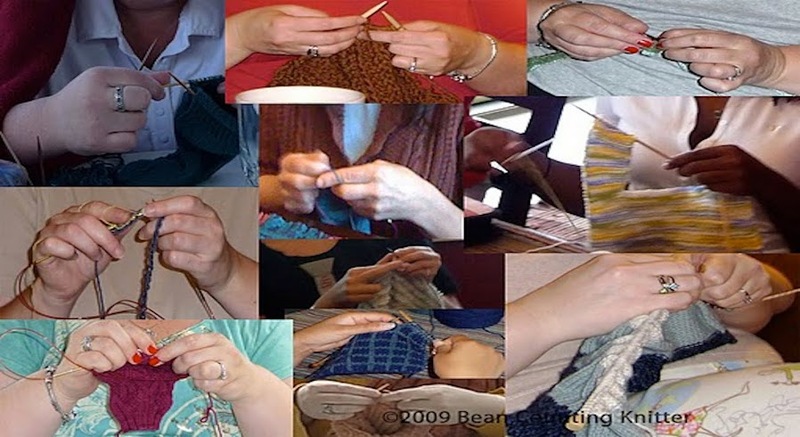 I went to Knit Knite last night and had a blast. I haven't laughed that hard in a long time. I am pretty sure we were very close to be evicted from Panera. 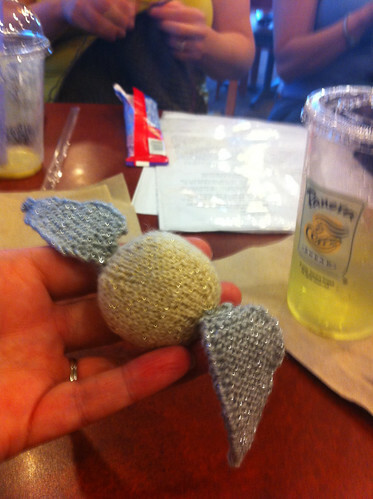 One of the Knit Knite ladies, Ann, knit a Golden Snitch. 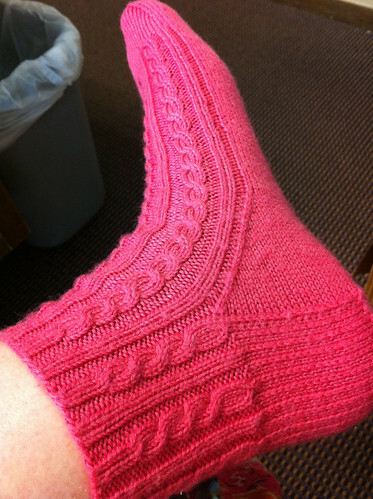 I am also very jealous of Ann as she is going to Sock Summit next week. I wonder if she is taking the Golden Snitch with her? Maybe she can take me instead? Here is an update for my 2011 finishing project. 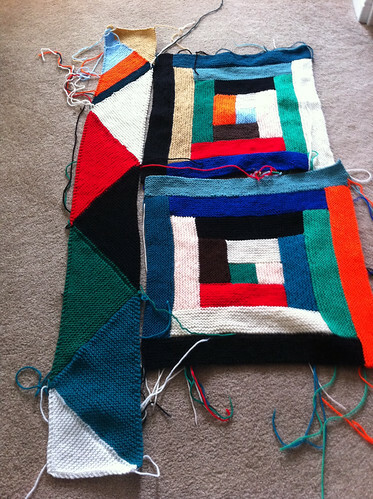 This is to be a donation blanket, It is the only project remaining that was started prior to 1/1/11. 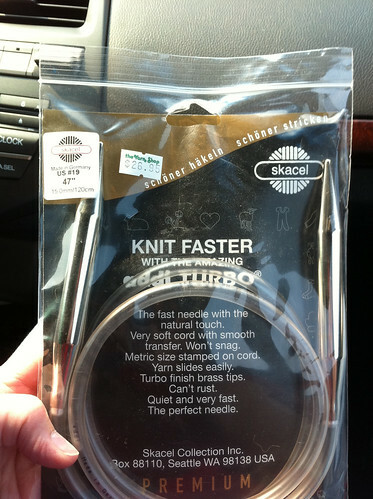 I better getting knitting. 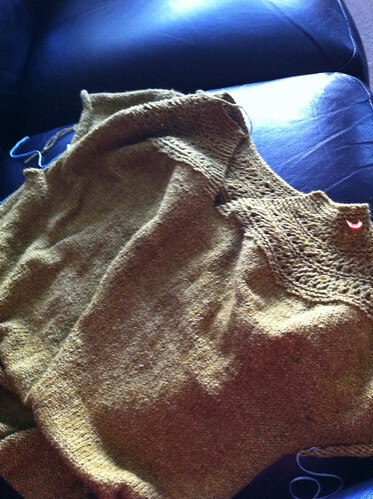 Actually Molly has said to pass it on to her when I am done knitting on it and she will finish it up. I may take her up on the offer. 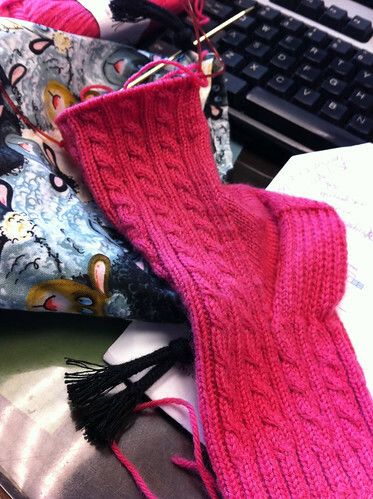 Here is the progress on the first BFF sock by Cookie A. I need to get cracking and finish these socks. 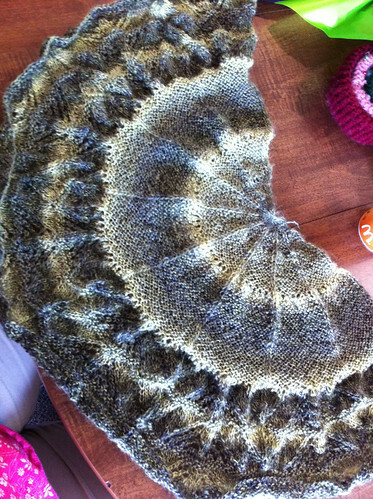 I finished Fannette by Melissa J. Goodale this weekend. 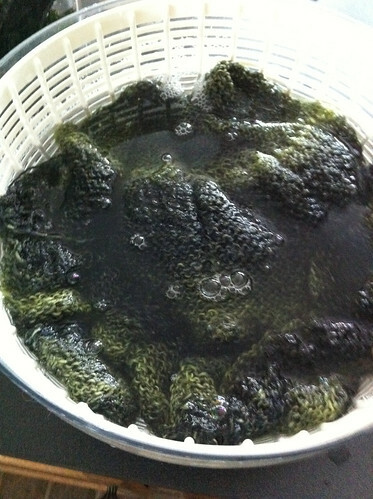 It is knit with Regia Hand-dye Effect. Here it is in the unblocked form. Not very impressive in my opinion. Gave it a bath with some wool soak. Oh yeah and if you don't know it the salad spinner isn't just for spinning salad. 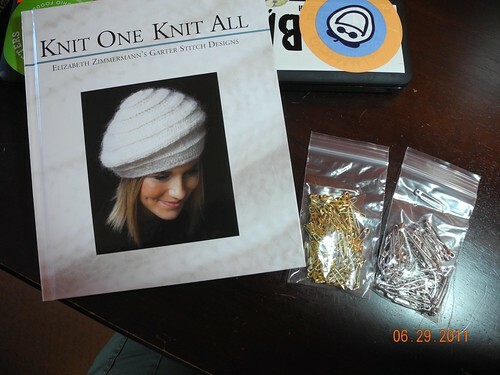 It is great for removing water from hand knits without the risk of felting. So there is your tip for the post. I was knitting this as part of a K-A-L on Ravelry. I was notified this morning that I was the first to finish the project so I am the winner of ond skein of Handmaiden Sea Three. I feel sort of silly since I didn't even know there was a prize. It was a very nice way to start Monday! 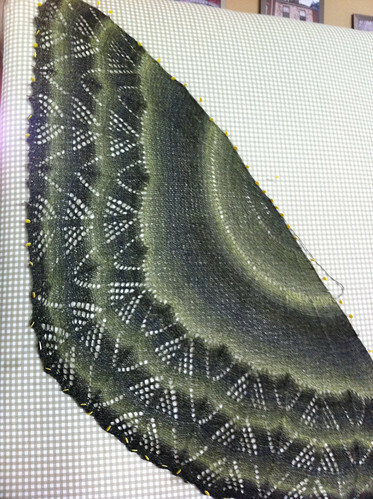 This project was also mentioned on Knitcircus's blog last week here. Poo is still a Rockstar! Poo's fan club, Ria, Twittered me yesterday asking for a Poo update! Poo is only too happy to oblige. A couple weekends ago we took Mr. Poop, as his loving Vet calls him, on a road trip overnight to my MILs. 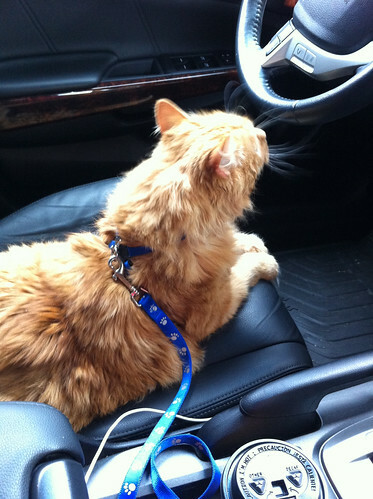 Here Poo got behind the wheel while Daddio went into the gas station. Here is our nephew, Mr. Ham, with Poo. It was their first time meeting each other but you would think they live together. Poo is not shy. If he likes you he will pile up in your lap immediately. Unlike our other villain, Kiki. Poo is doing good. 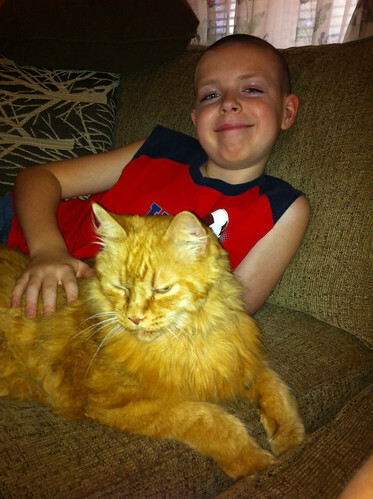 He is still diabetic despite no longer taking steroids. He gets a shot every 12 hours. He has good days and great days. As long is they are good or great we aren't complaining. I pulled this beauty out of my garden this morning. I sliced it up and tossed it with a very light coating of olive oil, sea salt and pepper. The slices then went into the dehydrator. I am hoping they will be perfect with some hummus tomorrow evening when I attend Picnic with the Pops with a knitting pal. Ummm I think I need new jeans because I was just able to pull the ones I have on down without unbuttoning/zipping. I am so grateful for the loving support of my friends and family (you know who you are). This last year has been difficult but I wouldn't change it for the world and with all of you I was able to get through it. Thank you! 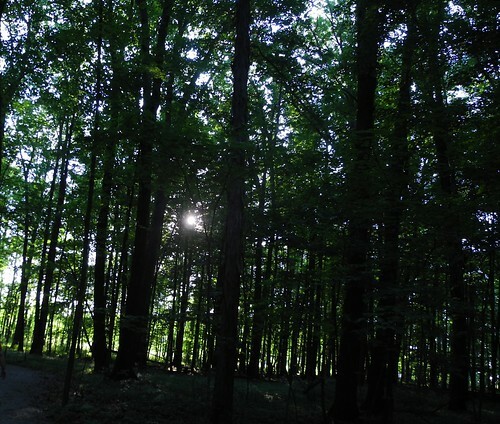 I have been on a spiritual path for a few years now. I wont get into my beliefs here but I will say I have been running across my connection with something greater than myself repeatedly this year. First, was standing at the ocean in Florida. Another time was at the Redwoods outside of San Francisco. 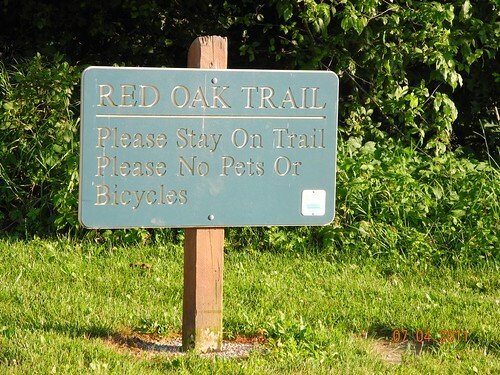 This time was on a walk through Glacier Ridge Metro Park with my better half. 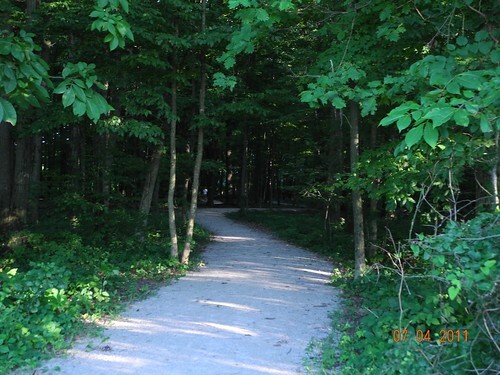 It was a very hot late afternoon so we walked a very short trail through the woods. This entry was so inviting on a hot muggy afternoon.